MHM Loves Modern House, the only Australian-based real estate agency that specializes in the sale of architect-designed houses and apartments – Modernist, mid-century and contemporary homes of outstanding design. They are located in central Sydney, but sell property throughout the Sydney metropolitan area and across NSW, in both urban and rural locations. Modern House pride themselves on the fact that they only market properties that they themselves are inspired by. The decision to represent a property is based upon the quality and integrity of its design, be it a bespoke house by a renowned architect or an imaginative alteration and addition by a young or emerging architect. They represent all manner of engaging spaces; from penthouses, converted warehouses and factories, to loft apartments, school conversions, industrial and farm properties. The Modern House focuses on homes of architectural distinction and outstanding design that were built or converted between the 1930s, the formative years of the International Modern Movement, and the present day. 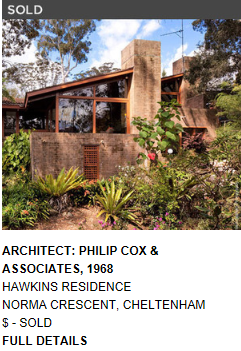 Modern House also states that it is committed to donating 10% of all professional fees from the sale of its listed residences to promote the future of NSW residential architecture, in the form of the Project Modern Fund. The proceeds of the fund are managed by two independent architects, each well-known for their creative approach to the education of architects in NSW. The fund is non-commercial and is focused on the promotion of young and emerging architects. An annual theme is chosen and the program of events is managed and run independently from the commercial business. In our Current Heritage Issues section MHM refer to the concerns we have surrounding the future of homes built in this period. Click here to read more. This era of architecture is not well understood by the general public and any service that highlights the beauty and sometimes hidden talents of these properties gets our full support! http://www.modernhouse.co/.